Italian Fresh Cream Lemon Cake, made with fresh Cream. The Perfect Breakfast or Snack Cake. A fast, easy and Delicious Lemon Cake. With Christmas right at our doorsteps. I hope you have had fun baking and cooking and that almost everything is done, from shopping to wrapping. (Since I have updated this recipe from 3 years ago, I can tell you no I haven’t even started shopping let alone wrapping). And now you can put up your feet at least for an hour or two and relax! Make yourself a coffee or tea and enjoy the holidays, and of course enjoy a slice of this amazing Italian Fresh Cream Lemon Cake. And making this cake again it’s still delicious every time I make it. And of course the Italian reminds me once again that this is his favourite cake! Wishing you my dear readers and friends a very Happy and Merry Christmas, to you and your family. And thank you so much for continuing to follow An Italian in my Kitchen. To go along with that coffee or tea I thought I would offer you a piece of this easy Lemon Cake to give you a little energy during this hectic holiday season. Melt butter and let cool completely. In a large bowl beat on medium speed beat eggs and sugar until light and fluffy. Fold in the flour mixture alternately with the cream into the creamed egg and sugar until completely combined. Gently fold in the zest, vanilla, melted butter and lemon juice. Pour into prepared pan and bake for approximately 35-40 minutes. Let cool, then dust with powdered/icing sugar. Enjoy! Italian cake is a much more compact and a less moist cake than we are used to in North America, although this cake is one of the most moist Italian cakes I have tried. In fact it has the same texture as my Easy Yogurt Cake it is actually quite similar to a Pound Cake. That’s why it makes the perfect Breakfast / Brunch / Snack Cake. Italians don’t usually serve cake for dessert. Unless of course they make a cake such as a Tiramisu or a Fancy Cake for a birthday. In fact dessert isn’t very common. They prefer to serve fruit or even a fresh fruit salad. This type of Easy Lemon Cake is usually served at breakfast or as a treat when someone is coming for coffee or tea, or as I served it, as a delicious Christmas morning cake. 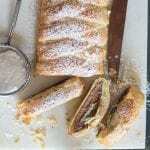 Or slice it in the middle and add a simple filling such as an Italian Pastry Cream , it would make a simple but perfect after dinner dessert, and don’t forget to finish it up with a simple Powdered Sugar Glaze. Delicious. I love lemons, I think it is one of the best citrus fruits for baking. Lemon bread, Lemon Cheesecake or one of my all time favourites, sorbet. I will learn to make the best ever Italian sorbet this year! And I did make a Lemon Sorbet, just the way my youngest daughter and I like it. 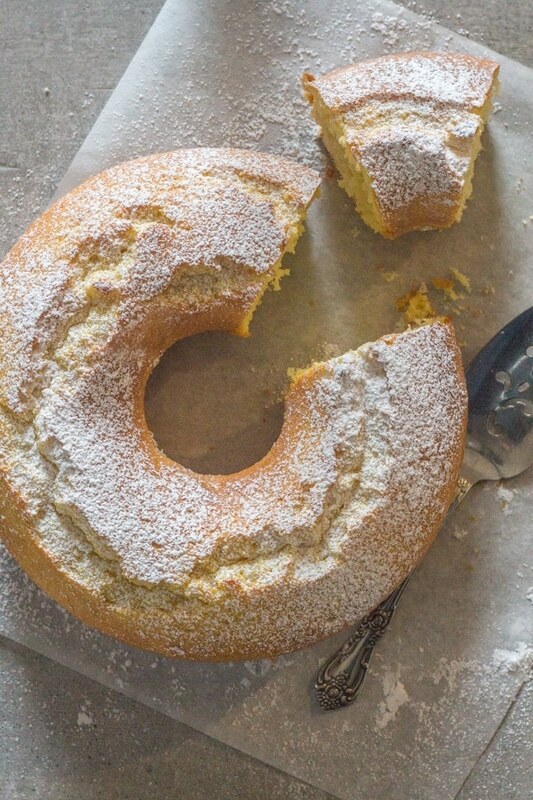 Italian Fresh Cream Lemon Cake is fast and really tasty, all it needs is a little dusting of icing sugar/powdered sugar and it is perfect. Enjoy! And Happy Holidays. 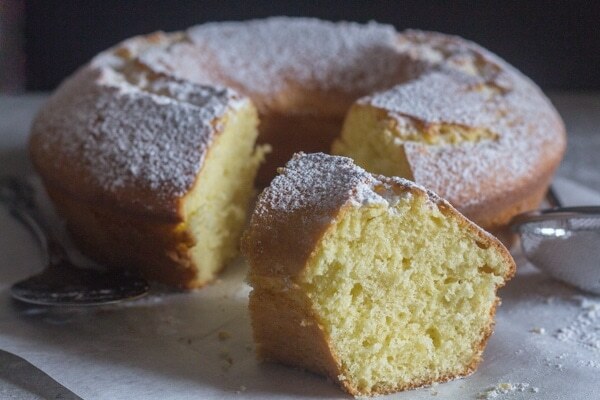 An easy simple Italian Cake, the perfect breakfast or snack cake. In a medium bowl whisk together flour,baking powder and salt set aside. Gently fold with a spatula the flour mixture, alternating with the cream into the egg mixture, keep folding until mixture is completely combined, then gently fold in the zest, vanilla ,melted butter and lemon juice. Pour the batter into the prepared pan and bake for approximately 35-40 minutes. Let cool completely, then dust with powdered/icing sugar. Enjoy! Republished from December 24, 2015. Hi Susan, thanks so much and so glad you enjoyed. Have a great day. Hi! This cake sounds lovely. What type of flour did you use? Thank you. Hi Elaine, I used regular all purpose flour. Hope you enjoy it. Just thought I would let you know how much I love this recipe! It is now my go to recipe whenever I have lemons in the house i need to use up. And what better way than to make this lovely cake! Always comes out perfect and everyone always asks how I made it. Thank you for sharing! Hi Mary, so glad you enjoy the cake, it’s one of my husband’s favourites. Have a great week. Hi Katie, I have never made this cake with gluten free flour so I don’t know how it reacts to the other ingredients, so I am thinking it is more the flour than the cream. 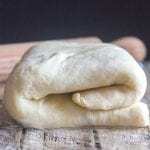 I made this recipe using Bob’s Red Mill Gluten Free Flour………perfect. Taste is awesome. I was careful not to over fold in my dry ingredints. Family didn’t even know it was GF until they saw me eating it. Hi Santiea so glad it worked for you and thanks for sharing. Happy New Year. Try King Arthur Gluten Free Flour, I found it to be most like Regular flour, I’ve never had an issue substituting a recipe with it. I’m going to make it today, with regular flour and replace the lemon with Orange and the extract I’ll use orange instead of vanilla. Hi Lance, thanks for the info. Have a great Sunday. I really do have to make this cake Rosemary, you’ve made it look so beautiful and Hungry Hubby would love it. He loves a “plain” cake i.e. one with no fillings or frostings. So I mix the eggs with the powdered sugar? I don’t see any other sugar option. Hi Nina, yes you do. Icing sugar is used in this cake rather than granulated sugar. How long will this sit on counter and still be good if it isn’t eaten up in one day? Can I bake this cake in a round 9 inch pan? Hi Rosalie, I’m sure you could. I hope you enjoy it! I do a lot of bread baking and prefer weight measures rather than volume, so really appreciated having those in the recipe. Came out a bit dry and dark after 42 minutes, but I think it was because I used a nonstick (dark) Bundt pan. Next time I will check internal temp at 35 minutes or so or use a different pan. Love the taste and the simplicity of this recipe. Hi Carol, thanks so much, Italian Cakes tend to be on the drier side, that’s why they serve them for breakfast or snack with coffee or tea. Just came across your blog and love it!!! I may try this cake for Easter this year , I have a large Italian family who’s in love with ? lemon!! Thanks so much Karen, hope you and your family enjoy it. 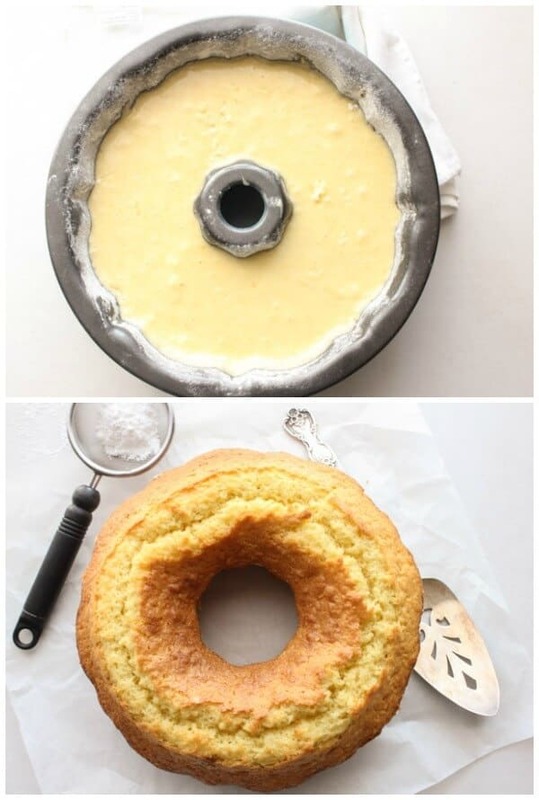 what size bundt pan is used for this delicious cake???? Hi Kat I used an 9 1/2 inch bundt pan. Have a great weekend. Tasty! I made this 2x this week. Instead of using the zest of 1 lemon, I used the zest of 2 Meyer lemons (they are smaller). I steeped the zest in the warm melted butter instead of adding it in at the end. I did this because I read people saying in the comments that they didn’t get enough lemon flavor so I googled “how to add more lemon taste to baked goods”. This seemed like a VERY easy tip to follow considering you’re supposed to melt the butter anyway. I was happy with the lemon flavor but I didn’t make it first as directed so I have nothing to compare it to, not sure it made a difference! I have a new convection oven and it’s making estimating baking time a little more difficult. After my first attempt I dropped the temp by 25 degrees and cooked for 7 less minutes for optimal cake goodness. Just an FYI to other new convection oven bakers. Can this be baked in 2 loaf pans? Since it is only for me, I would need to freeze 1/2 of it so loafs make more sense. How would this affect the baking time? I am not much of a baker either. Thanks for the help? Hi Karen, yes it can if you are using small loaves check after approximately 30 minutes to see if it’s done. Thanks Brian, I hope you enjoy it. Hi April, thanks so much and yes perfect with coffee in the morning. This would be perfect for Christmas morning but who’s gonna wait? I’m making it this weekend. Looks delicious! Hi Richa, thanks so much hope you enjoy it. Have a great weekend. My mom and I both share and undying love of all things lemon. I can’t wait to make this for her for Mother’s Day! Thanks Meaghan hope you both enjoy it. Just put the cake in the oven. It came out kinda thick when i put it in the pan. Hope it comes out ok. Looks so yummy. Husbands Italian Granny use to make this for him, so I thought I would try to make it for him. Fingers crossed. Followed directions and it burnt a bit, and i did use whole wheat flour. Could that have been the reason? Made this today and it is a lovely cake. I wish it had more of a lemony punch, so next time I will add lemon extract. I’m currently going to search for a lemony icing to pair the cake with. Thanks for sharing! Hi Ana, so glad you enjoyed it, sounds like a delicious addition. A lemon icing I have used is to put lemon extract in the powdered sugar when you mix it. You can make it as lemony as you want it. Made this as a birthday cake for my Mom’s birthday 1/26/17. I counteracted the dryness by drizzling it with the lemon buttercream frosting (but I used 1 stick of butter & 8 oz cream cheese). My lemon was quite large so lots of zest in cake & lots of lemon juice in icing. Icing was a little runny but great for drizzling. It turned out great. Will definitely make it again but may take it out of the oven 5-10 minutes earlier. Would like to try this with the lemon curd recipe. Hi Karen, thanks, what a great idea. I think it would be really good with the lemon curd recipe. Hi – Can you make this with Half and Half Cream? I don’t have other items in house and don’t want to run out today. Thanks. Hi Linda, I’m sure that would work. Let me know how it goes. Cake was good! I made it with Land Lakes Half and Half and Namaste Gluten Free Perfect Flour Blend. Also, I used 1 stick ( 8 tablespoons) of Keller Salted Butter because reviews said cake was a little dry. I baked in a tube pan. Will definitely make it again. I have my mom’s butter pound cake recipe (which is excellent) but wanted to try something different. Thanks. Hi Linda, sounds great, so glad you liked it. Italian cakes are usually dry, believe me I have had my share of dry Italian Cakes and this one is moist compared to some of them. 🙂 Have a great weekend. I must have done something wrong; I was thinking this would be a really moist cake but it is dry. Maybe I over cooked it but I took it out at 40 minutes. Hi you have to remember that Italian cakes are more on the dry side, Italians like to eat their cakes very plain and with a cup of tea or with a cafe latte in the morning. It could also be that it was baked a little too much. Hi Josephine, where it says beat eggs and sugar by sugar I mean the 1 3/4 cups icing/powdered sugar. Hope that helps. I am confused also by the powered sugar. In the recipe it does Not say anything about the powder sugar in the ingrediant I see it just for dusting. In the video it shows the powder sugar for dusting. Not sure if I’m miss reading your recipe. I have it baking now! Hi Lori, I’m sorry I am really confused, in the ingredients it states 1 3/4 cups icing/powdered sugar (because some people call it icing sugar and some people call it powdered sugar), and then in the directions it says “In a large bowl beat on medium speed eggs and sugar until light and fluffy” meaning icing/powdered sugar. So I don’t know what you mean. thanks. Let me know. Oh do I feel like a nut!! Where it says 1/34 cup powdered sugar, I did not put P in front of the sugar, so I used regular sugar!! It did come out a tad dry but not bad at all!! I will try it again!! Thank you so much for you reply!! Hi Lori, haha no problem. Remember Italian Cakes are drier, that’s why they are usually served at breakfast with a cafe latte or in the afternoon with coffee. This one I find not nearly as dry as some that I have eaten here. You might like to serve it with some fresh fruit and whipped cream. Let me know. Hi Kp thanks great idea. Hello! Can I use a normal loaf pan to bake these? How long will I bake them for if in a loaf pan? Thanks! Hi Sarah, I’m sure you can use a loaf pan, depending on the size I would start to check at around 25 minutes. Hope that helps. This was a wonderful recipe. My mother is from Florence, Italy and she always made cakes without frostings. So, I like these plain type of tea/coffee cakes. I have been looking for a heavier pound cake like this. It’s perfect. Now, I want to try your orange cake. Thank you. Thanks MG so glad you like it, and your mother is from one of the most beautiful cities in Italy. You might want to try the Yogurt Cake too, that’s my eldest daughter’s favourite. Have a great week. 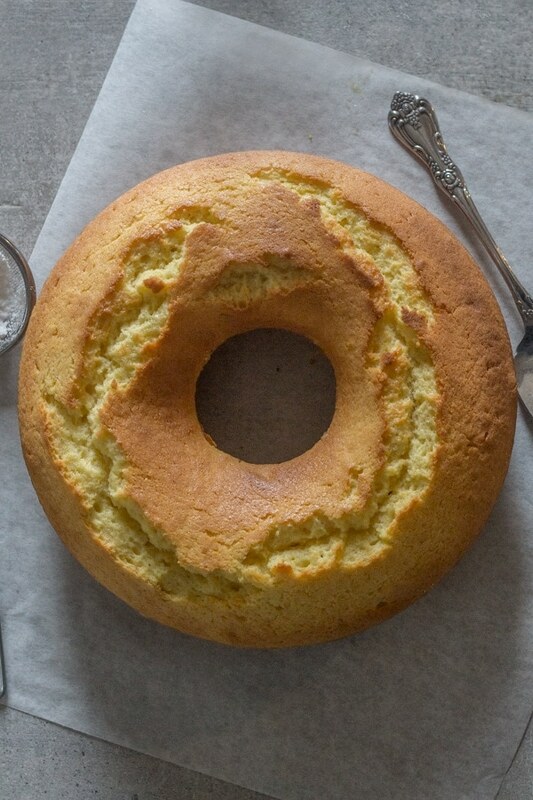 My mother-in-law is from the Naples area, and she to makes a similar cake, more like a sponge. This is the closest I will ever come to her cake and she loved it, we all did. It looks exactly as yours. Thanks for sharing. Can’t wait to try other recipes. Grazie! Hi Sonia, thanks your welcome and so glad to hear that. Have a wonderful Christmas. Hi Kathy, I do have an Italian Sponge cake (that was my mother-in-law’s recipe) on the blog. Here is the link. Italian Sponge cakes are quite dry that’s why they are great for a tiramisu. Hope this helps. Have a great week. Can you make this in a springform pan? I thought it would be good adding in blueberries. Hi Sara, I don’t see why not, and I’m sure it will be delicious with blueberries. Let me know how you like it. Hi Lisa, well you could apparently but you should use full fat greek yogurt. Hope that helps. Can I use sour cream? Or just 2% milk. I hate to run to store to just get cream..
Hi Kara, I think sour cream would give it a totally different taste, I only make it with cream so I can’t say if it would work or not. Just made this cake and it didn’t disappoint! Fast, easy and I just about had everything at home. It is a moist lemony pound like cake. Will go great with a cup of tea! I can see adding fresh berries and cream in the summer to make it a dessert. A keeper! I’ve shared the recipe on my Facebook page! I whipped this cake up in a matter of minutes. It was delicious. Everyone loved it, especially my dog Max, he grabbed a piece right off my plate. It was light and lemony. I would definitely make this again. Thanks for sharing it. Do you use salted or unsalted butter? Or, do you use margarine? Hi Heather I always use salted butter. Un salted is very hard to find in Italy. Thank you! Made it yesterday. Perfect for morning with a cup of coffee! Hi Heather so glad you enjoy it. Have a wonderful weekend. 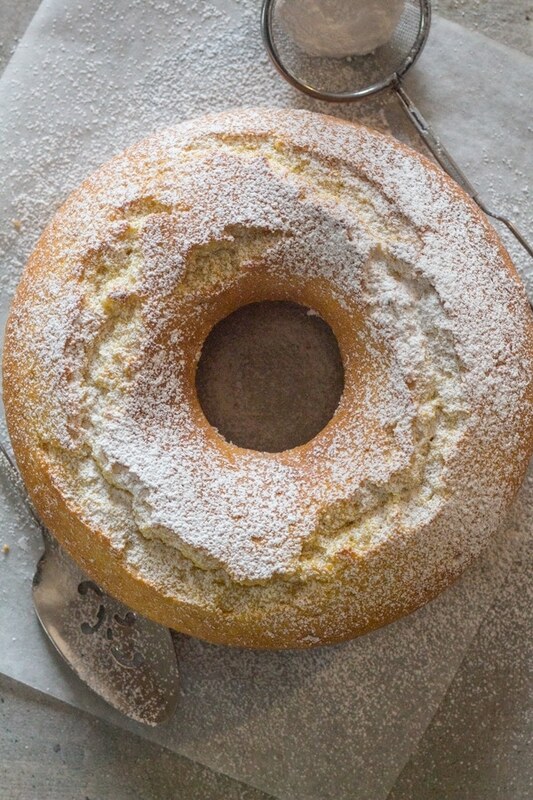 Hi June, the recipe for the Lemon Cake is on the page. Hope that helps. Thank you for sharing this recipe, I used the zest of a large lemon from my lemon tree and it was delicious! I’ve made this cake twice in the past two weeks. My family loves it for breakfast. It’s super easy, super quick and super delicious! Hi Sheila, thanks so glad you all enjoy it! Have a great week. I just made this and it is amazing! I am using it as the cake in a strawberry trifle for a dinner party tomorrow night. I think it’s going to be a hit! Hi Michelle, so glad you liked it, let me know how it went. Have a great weekend. Hello – I actually just made this cake and took it out of the oven a few minutes ago. A couple of questions: Did you use a flute pan in the pic? How long should it cool in the pan before removing it to a rack? What makes this specifically Italian? I can’t wait to taste it as soon as it cools enough -mine however doesn’t look as pretty on top as yours – having w/iced tea because it’s way too hot today for hot tea. Hi Michelle, I hope you enjoyed the cake, I actually used a tube pan, I let it cool to the touch and then removed it. 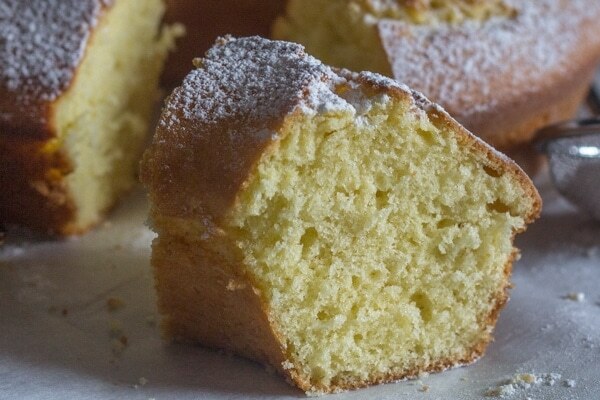 What makes it an Italian cake is the fact that is quite plain and dusted with a little Powdered sugar, no frostings or extras. Perfect with a cup of tea. Hi Beverley, thanks, it one of our favourites! 🙂 Have a great weekend. Hi Rosemary, instead of the powdered sugar, can I substitute it with normal caster sugar? Thanks. Hi Susy, to tell you the truth I don’t think I would, because icing sugar is a lot finer than caster sugar. But if you feel like trying it give it a try, why not half the recipe to see and let me know if you do. Have a great weekend. It came out great! I need to get a bundt pan like you used. This will be a staple cake for me. Thanks. I made this beautiful cake …its in the oven! I was aittle confused with how you wanted to alternate the items (l”m not good at cooking). Smells great!! Can’t wait! Hi Sherry, sorry you were confused, I will have to check out the instructions. Hope you enjoy it, let me know. I was so excited to find this recipe!! My Girl Scout troop picked Italy for our annual World Thinking Day country and I was looking for an easy food my 10 year old GS could make! This fits the bill. We will be making it on Saturday. I’ll let you know how it goes! Also, do you think you could bake two cakes at a time? Do you mean double the recipe? If so I don’t see why not. Let me know how it goes. Hi Beth, oh great, hope you and the Girls enjoy it. Happy baking. I have a rather silly question that I may have missed the answer to. Is the additional tablespoon of flour to be used for dusting the pan or is it to go into the cake batter? Thank you! I’m excited to make this! Hi Veronica, yes the additional tablespoon of flour does go into the cake batter. Hope you enjoy it, let me know. Have a great day. I love lemon cake and this sounds so delicious! Yum! Thanks so much it is really good. Have a great Sunday. I made this cake yesterday and enjoyed it today with blackberry gelato. The texture of the cake came out a bit different than I expected, but I found it to be absolutely delicious. The order of mixing the ingredients was interesting- it was almost like a cookie dough at first then I added the butter and bam- cake mixture. I will certainly make this recipe again! I think I will add in some lemon extract, as people have mentioned before, for a more lemon-y flavor. Hi Jessica, so glad you enjoyed it, and that blackberry gelato sounds amazing. Have a great week. I’m making this right now for Easter tomorrow. There is no mention what you do with the cream. Do you put it in with the egg / sugar mixture initially. Thanks for clarifying. It’s in the oven-hope it turns out! Hi Jamie, if you look on the instructions #5 I wrote “In a medium bowl whisk together flour,baking powder and salt, then alternating with the cream gently fold into egg mixture with a spatula”, let me know how it turns out. Hope you enjoy it! Happy Easter. Hi Melissa, so glad you enjoyed it. Have a great day. I must try this now! Butter, I’m assuming, is salted? And thanks a million times for the metric measurements! Our silly American cups and such aren’t very accurate, and using weights also saves on dirty dishes. I made this cake last week and brought it to work and everyone raved about it. It was gone in less than 2 hours. I added 1/2 a teaspoon of lemon juice in the batter and followed the rest of the recipe. I will definitely make it again! Thanks for the recipe! Hi Beth, so glad you all enjoyed it. Good idea with the lemon juice. Have a great week. Do you add the whole egg ? Hi Halie, yes the whole egg. 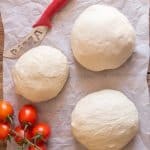 has anyone tried subbing the flour with white rice flour or something similar in an organic flour? thanks. Hi Shirley, I haven’t heard of anyone subbing the flour, but I will let you know if I do. Hi Joyce, they say that “Lemon juice adds both lemon flavor and sourness whereas the zest only adds the lemon flavor”, remember when you are adding juice you are also adding extra liquid. And you want to be careful with adding juice to this recipe because you don’t want to curdle the cream, one reader mentioned adding lemon extract instead of vanilla, I think I would go with that, or add the zest to 1 1/2 lemons instead of one. Also there is more lemon flavour in the zest than in the juice, you decide, and I would love to know how it comes out. Could this be made as a cake with a fruit or cheese filling between layers of the cake? Hi Jasmine, sure I bet it would be amazing. Let me know. I read in a different comment, that you could substitute milk for heavy cream. Could you also substitute half and half for the heavy cream? This sounds delicious! Hi M, if you substitute milk then you have to add extra butter, but I think a substitute of 1 for 1, half and half for heavy cream would work. Let me know how it comes out. Do you think if I used half and half instead of the cream it would still turn out OK? Hi Judy, I think half and half would work. Let me know how it is. Can I add the juice of the lemon, or lemon extract in addition to the vanilla? Hi Mark, why don’t you try half and half and see how it goes? Curious if one might use lemon extract rather than vanilla extract to enhance the lemon flavor. I love lemon but wondered if zest of one lemon gives it enough “lemon” taste. Looks wonderful! Thanks! Hi Sandy, thanks, for me the lemon taste was good, but if you prefer a stronger taste then by all means try using the extract. But did you know that the stronger lemon taste is in the zest and not the juice. I discovered that not too long ago. Have a great day. Hi Whitney, thanks hope you enjoy it. Oh how I adore lemon cake! Your version looks divine! Can’t wait to try this Rosemary! Hi Megan Thanks, let me know how you like it. Thanks Brian, my husband would agree! Hope you enjoy it! Luscious indeed! I adore lemon cake. This one looks like a perfect after dinner treat my husband would love! Hi Diane, thanks I love lemon dessert also. 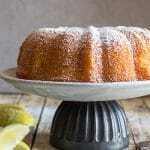 I lost my bundt cake pan in a recent move and now I know I need to get another one to make this lemon cake. It looks so delicious!! Hi Tracy, I love bundt cakes, I’m starting a collection. Have a great weekend. Anything Lemon works for me! Now I’ve got to try this recipe. Looks so scrumptious! Hi Tina, thanks hope you enjoy it. Hi Renee, thanks hope you like it. Have a great weekend. This is ridiculously gorgeous and sounds delicious! The title alone grabbed me! Thanks Karen, it’s pretty yummy, have a great weekend. I love how beautiful this cake is, and it sounds fabulous. In the article you say that Italian cakes are more compact and less moist. Would you say this cake is sort of dry & dense? What would you compare the texture to? I only ask because if it’s not moist enough I will be the only one that eats it…the last thing I need is to eat the better part of an entire cake all by myself, haha. Hi Wendi, thanks, no I wouldn’t say this is dry, I would compare it to a pound cake except maybe a bit lighter. I’m sure they will like it. Hope that helps, or you could freeze half (let cool completely, wrap first in plastic then foil before freezing, to thaw unwrap and let thaw at room temperature for about 30 minutes) that way you aren’t technically eating a whole cake. Have a great week. Love your website. 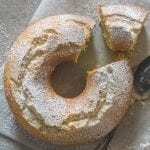 Want to make your Italian Fresh Cream Lemon Cake but don’t have any cream in the house. Can I use 2% milk? Hi Marzia, thanks so much, I discovered that in order to substitute milk for the cream, instead of 2/3 cup cream you can use 7 tablespoons milk and 3 1/2 tablespoons butter melted (stir them together) and add in place of the cream. If you are using unsalted butter, add 1/4 teaspoon of salt instead of 1/2. Should work let me know. Hope that helps. Hi! I appreciate the metric measurements in the recipe. Thank you! Hi Hillevi, your welcome. Have a wonderful Sunday. I’m from Australia and would like to know with the flour is it Plain Flour or Self Raising Flour? Would love to try to make this cake as it looks very inviting. Hi Narelle, thanks, it is plain flour (or all purpose flour). Just to let you know, when I write flour it’s always plain/all purpose. Hope that helps, have a great Sunday. What a beautiful lemon cake. It looks so moist and delicious! Looks delicious. Cannot wait to try the recipe. Can I please confirm if this recipe uses “caster” sugar or icing sugar to beat with the eggs? I am in Australia and I usually use caster sugar not the sugar you use to dust the tops of cake or use to make icing. Hi Ali, this recipe uses icing sugar to beat with the eggs, since writing a blog I never realized just how many different names for sugars there are in the world. So your “caster” sugar is what I call fruit sugar or fine sugar and powdered sugar is also icing sugar. I should write a post just on sugar. 🙂 Have a great day. So use only powdered sugar? I love how easy this recipe sounds, and the fresh flavors! Perfect for a dinner party. Thank you for the inspiration. Hi Denise, yes it is quite easy, hope you enjoy it. This cake is perfect for me, love the lemon flavors and the fresh cream! Hi Christie, thanks hope you enjoy it. What a lovely cake, Rosemary! Oh, I can0t resist anything with lemon. Pinned! Oh My Gosh this looks yummy! 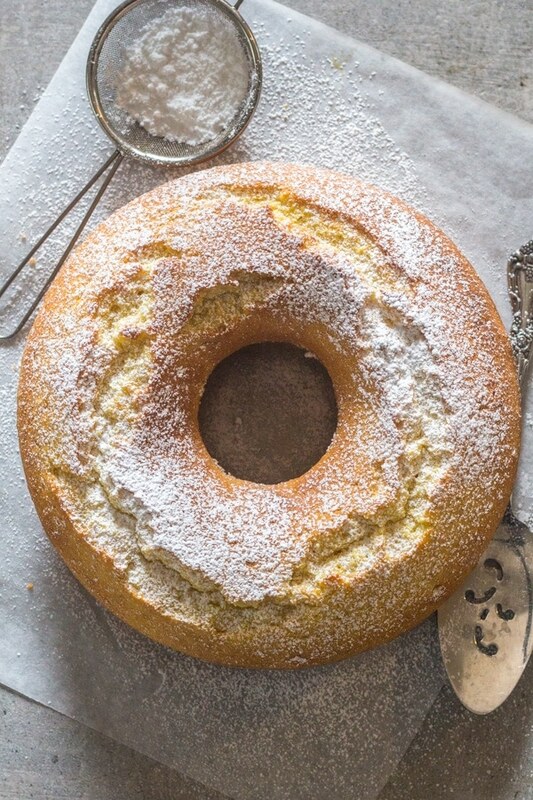 I adore lemon pound cake and this sounds like it’s taken to a whole new level! Hi Megin, thanks for stopping by. Sounds yummy. Do you whip the cream before folding in? Hi Janet, no you don’t whip the cream. Have a great day. What exactly is “whole” cream? Hi Donna whole cream is heavy cream, that is the only cream available in Italy, so you could use heavy cream or whipping cream. Happy New Year. This really looks so gorgeous, I keep clicking on the Buzzfeed article it featured in to come and look at how beautiful it is, time and time again! Hi Jo, haha thanks I kind of liked it too 🙂 Have a Happy New Year. What a gorgeous dessert! This sounds wonderful! Hi Liz, thanks so much. Happy New Year. I just love anything with lemon in it. Can’t wait to make this. Have already printed the recipe. I wish you and your family a very Merry Christmas. Made this this morning for my husbands birthday. He really likes it, has been dunking it in his coffee all is day. I thought it would be moisture, maybe I did not miss the eggs long enough. This is a make again.